“The winner takes it all, the loser standing small” (an Abba song) is the next phase in the world economy. Sadly there will be few real winners since the world and its people will be the loser in the coming phase of destruction of asset values, implosion of debts as well as a breakdown of the fabric of society. I do realise that this all sounds very gloomy, and also that bearers of bad news are not popular. But the world is now facing an inevitable breakdown of the biggest debt and asset bubble in history. It is absolutely certain that this will happen, so it is in my mind not a question of if but only when. Although we will all be losers to some extent, there are be some who are better protected than others. And the few people who understand this will be the winners in the investment world. This week I want to make the message simple. There is one graph that tells the whole story of what will happen in the next few years. Anyone who “gets” this chart also understands what is going to happen. But there is only a minuscule percentage of maybe 0.5% of the investment population who would even look at a simple chart that could be the difference between misery and fortune. This means that over 99% of the investment world will not be prepared for what is coming next and most of these people will see a destruction of their assets to an extent that has never occurred previously in history. Their journey will end up in miseries whilst the few who take the tide that leads to fortune will have secured their financial position. The chart I am talking about is the stock market compared to gold. I will take the US market as the example but the ratio chart gold versus stocks could be applied to most stock markets in the world. If we first look at the Dow/Gold chart since 1997, we find that it topped in July 1999 at 45. This means that one unit of the Dow bought 45 ounces of gold. It then crashed by 87% to 6 in 2011. Since then there has been a steady recovery to the 20 level. In technical terms that means a very normal 38% correction. So 19 years after the Dow/Gold top in 1999, the stock market is still extremely weak measured in real terms or real money which is gold. And this is in spite of a major recovery in stocks since the 2009 bottom. This bodes ill for stocks. Whether the correction goes a bit higher than the 20 level is irrelevant. The chart shows that stocks have recovered in nominal terms due to massive money printing. But in real terms, stocks are in a long term downtrend since 1999 and this downtrend will soon resume with a vengeance. To understand the longer trend we need to look at a long term chart since 1800. The chart below shows that stocks have been in a long term uptrend against gold for 200 years. This is the natural consequence of the real growth of the world economy fuelled by industrialisation and the discovery of oil. Between 1800 and 1913, the swings of the Gold/Dow ratio were relatively small with one exception. But with the foundation of the Fed and modern central banking the swings became much greater. 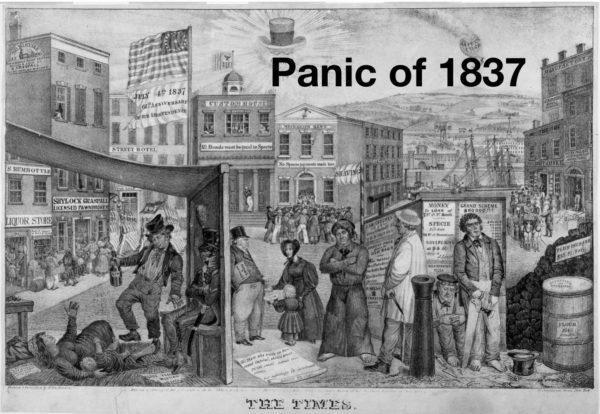 The biggest crisis in the 1800s was the Panic of 1837 which lasted until 1844. As with all crises, this one was preceded by a major speculative bubble with stock and land prices surging together with commodities like cotton and also slave prices. 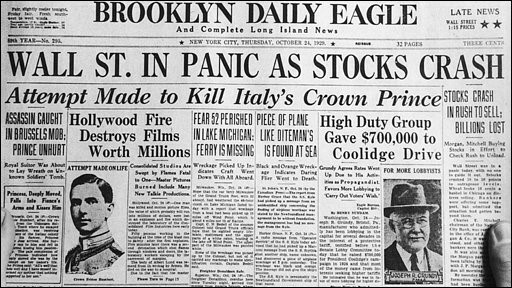 This led to a deflationary crash and a depression with high unemployment and bank failures. Out of 850 US banks, 343 closed entirely and 62 failed partially. 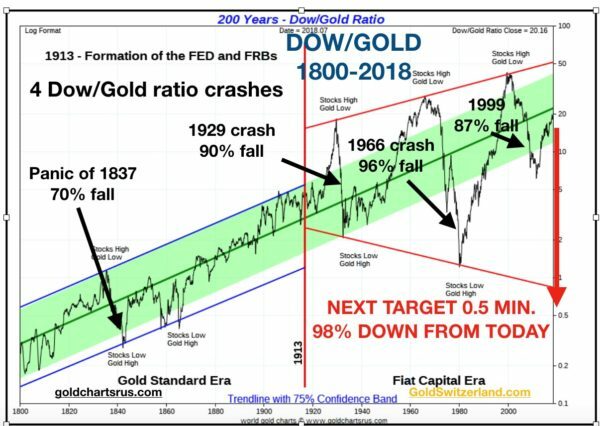 During the 7 year crash, the Dow/Gold ratio declined by 70%. This was by far the biggest decline of the ratio in the 19th century. 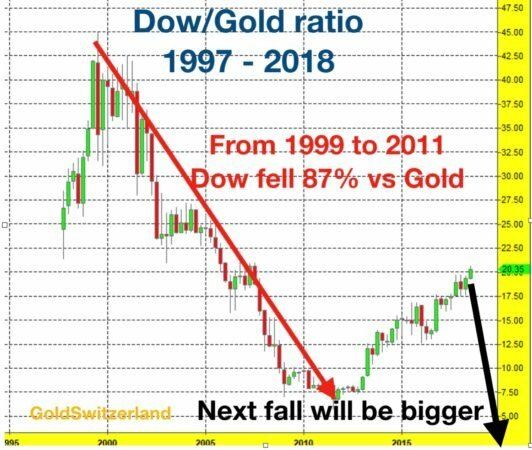 A fall of that magnitude will involve a stock crash from here of 98% against gold. For the few who will anticipate this fall, it will lead to fortune. But for the 99.5% of investors who will not solve this relatively simple Gordian knot, it will mean misery and the biggest wealth destruction in history. Seldom has an investment decision been simpler. According to the legend, Alexander the Great also had a simple solution to the Gordian knot. He used his sword and cut it in half. Although this version is disputed by some, it does show that there are very simple choices that can solve what seems complex problems. The dilemma is of course that most people cannot even see the present knot. All they see is a continuous long term uptrend of stocks that will go on forever. Little do they understand that the gyrations in the Dow/Gold ratio will continue until the megaphone pattern is completed on the downside. Whether the ratio reaches 1 to 1 like in 1980 or overshoots to 1/2 to 1 or less is irrelevant. What is important to understand is that governments and central banks have created a bubble of such proportions that when it pops, it will lead to a wealth destruction and a wealth transfer never before seen in history. I am here taking the Dow as an example of a stock market but remember that the next crash will be a global phenomenon and no market will escape. 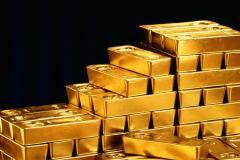 I am not saying that the holders of physical gold will totally avoid the misfortunes that will hit the world. Everyone will suffer. But when the panic starts, the ones who have taken protection in physical gold and some silver will feel a lot more secure than the ones who are still in the stocks or other bubble markets. 100 years of financial mismanagement has not finished the 5,000 year track record of gold as the only money which has survived in history. The next 4 to 8 years will prove that again.